We all do it. 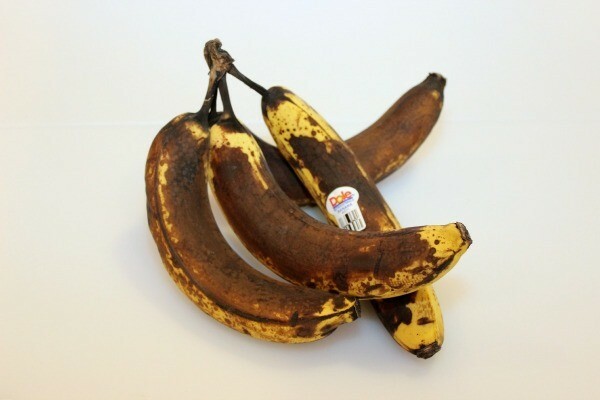 End up with a couple of bananas that are just too ripe to be enjoyable. And in the spirit of giving up binning food I thought I would share a recipe that it quick, tasty and not too indulgent. Banana bread that is definitely more bread than cake. So easy to make that I left my 11 year old to get on with it by himself while I made dinner. The boy did good – there wasn’t that much more mess than if I had done it myself. This recipe is inspired by the Australian Women’s Weekly Everyday Cakes and Cookies hence measurements are in cups. The oven needs to be set to 220C/200C for a fan oven. Grease and line a loaf tin. Sift the flour and cinnamon into large bowl and then rub the butter in. Stir all the other ingredients into the flour but don’t overmix, it really doesn’t matter if the mix is lumpy. Tip the mixture into the prepared tin and shove it in the oven for about half an hour. Yes, it really is that easy. It will rise and turn a golden brown. You can check it is done by sliding a knife in and if it comes out clean it is done. Leave it to cool in the tin for a few minutes and then turn it onto a wire rack. It is very hard to resist while it is still warm from the oven. Slices of this bread toast beautifully and are delicious with a bit of butter.